The first violin part for Beethoven's Symphony No. 7 in A major, Op. 92 has been edited by Ilya Kaler, who has appeared as guest concertmaster with the San Francisco Symphony, Philadelphia Orchestra and Baltimore Symphony. Kaler's bowings, fingerings and other editorial markings have been added throughout the score. The Seventh Symphony was composed by Beethoven between 1811 and 1812 and dedicated to Count Moritz von Fries. The symphony as a whole is known for its use of rhythmic devices suggestive of a dance, such as dotted rhythm and repeated rhythmic figures. At its 1813 premiere the work was very well received, and the second movement (Allegretto) had to be encored immediately. During this performance Beethoven himself remarked that it was one of his best works. Although the entire Seventh Symphony is famous, the instant and long-standing popularity of the second movement has resulted in its frequent performance separate from the complete work. Download and print the score today to gain access to expertly edited Beethoven Symphony No. 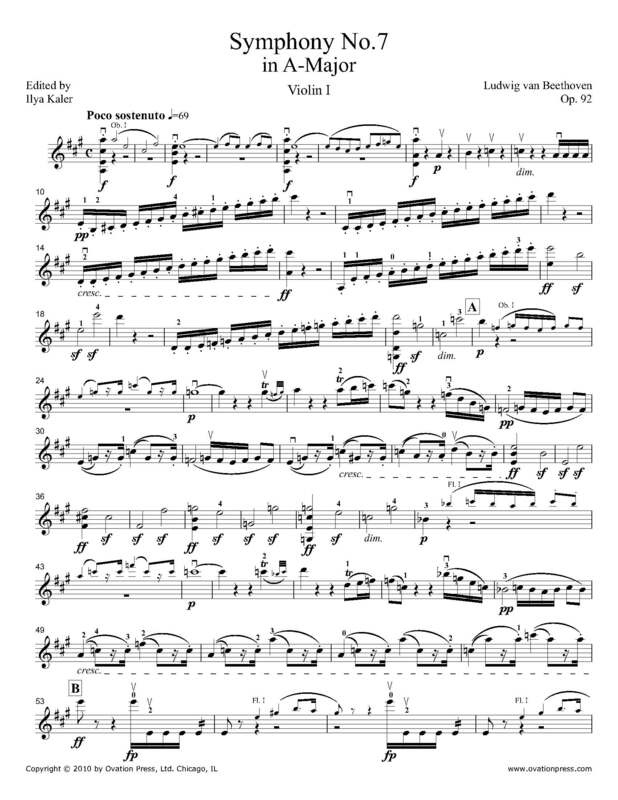 7 violin fingerings and bowings from Ilya Kaler!